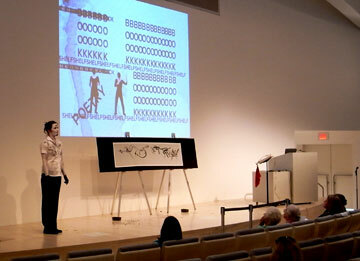 This one-of-a-kind presentation challenges conventional thinking about the literary components by undermining the traditional dichotomy and by playing complementarity and ambiguity of the following: presentation and performance, writing and speaking (manually), language and gesture, poetry and prose, looking and reading, literality and metaphor. This work is based on Derridean deconstruction of the concepts and meanings of language and literature. 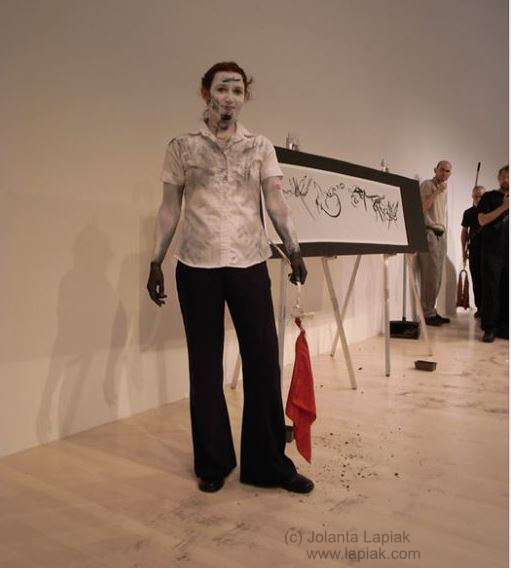 My postmodern presentation blends a weave of the performance, work of art, calligraphy, prose, and poetry all in Ameslan or ASL. Instead of giving a live talk, I made a talk in advance and let my "other self" talk from another time via video. Dissociated time. Milwaukee Art Museum, Wisconsin, USA. This poetic presentation celebrates a rich potential of how visual-manual language can transform literary components into other dimensional forms, for example, by metamorphosing calligraphy into verbal calligraphy. It enhances the beauty and richness of Ameslan. In this signature performance of mine, I turned four-dimensional language (in visual-spatial modality) into 2-dimensional language (writing). 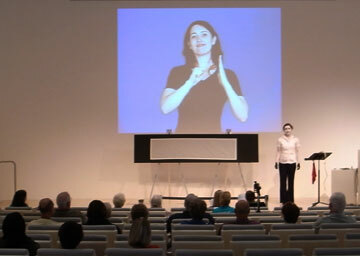 The black line movement on the white surface reflects the movement of ASL signing. Then I repeated my ASL lines in 4-dimensional that my black hands, which represent a pen or any writing instrucment, made marks on my white clothes which represent a paper. This blurs the line between writing and (manually) speaking. I'm the writer and speaker at the same time. 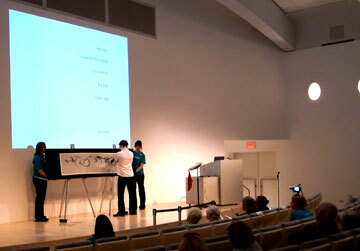 In my signature closing, I invited the audience to break the paper barberwire-like rope. In this way, we united (rope) to break audism. The red kierachief has been used in the past performance arts. I carried it like a flame. It represents blood as in Deaf sister/brotherhood or heart.